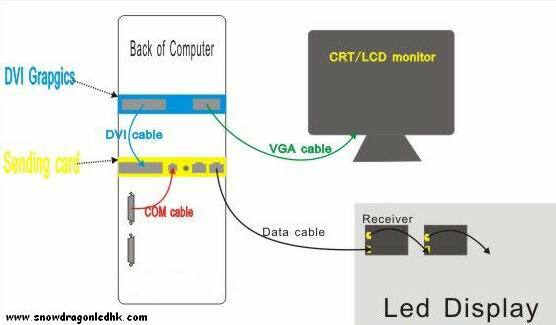 This Image shows the main way of link a led display with PC. The display sign derives from PC and outputs from DVI grapgics traffic by DVI cable to sending card,in sending card this DVI sign turn into sign traffic with Data cable to Receiver cards. The control Sign come form COM Port transit COM cable to sending card.And transit data cable to Receiver cards to control display of LED screen.In a sending card only the first output post can sending the control sing to display. VGA sign from DVI gragics link to Monitor,to let us watch the state of this screen.The Receiver cards can be serial 1 by 1.